Today’s guest author is Nichole Kelly, author of How to Measure Social Media. She covers a range of topics about digital marketing strategies. Social media is so common nowadays, you might assume every business is clamoring to use it at the earliest possible opportunity. Surprisingly, however, that’s often not the case. Convincing management that your company should be active on social media takes more than just good old-fashioned “Hey, let’s put on a show” enthusiasm. Executives care about impact on sales volume, revenue and cost. And since management teams are held accountable for financial success, they need to understand how social media management will affect their company’s bottom line before they’ll give it their full support. Well, the best way is to show them where social media fits in the sales funnel. 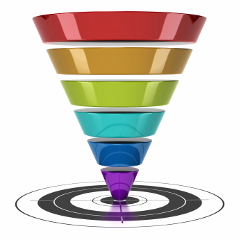 Nothing illustrates the sales and revenue-generation process to executives like a sales funnel. So use it to explain the benefits of social media to management teams in a language they can understand. Traditionally, the sales funnel starts when a prospective customer does something that triggers your sales process — scheduling a meeting with a salesperson, say, or responding to a pay-per-click ad. The advantage of social media, however, is that it allows your company to “extend” its sales funnel by adding three additional stages to the beginning, thus allowing you to beat your competition to prospects and more opportunities to convert prospective clients. The exposure section of the sales funnel focuses on brand reach. Here the idea is that the more your brand is seen, the more people are likely to remember it. This is essentially the first stage in measuring brand awareness, and in some ways it’s the most important, since the more people you put into the top of the funnel, the more opportunities your company will have to create sales. In PR and online advertising, exposure is measured in “impressions.” Circulation, viewers or listeners are common measures of impressions in public relations; in social media, fans, followers or subscribers are often used. Bear in mind that in either area, impressions don’t equate to people actually noticing your ad — just because your add pops up during “Here Comes Honey Boo Boo” or on Aunt Janet’s Jon Bon Jovi Facebook fan page, it doesn’t mean somebody will actually hear or see it. We’re simply talking about potential here. Social media does offer one important advantage over traditional media in this regard: It gives you the chance to significantly increase the number of people who are exposed to your brand at a fraction of the cost. The influence section of the funnel describes people who were exposed to your brand by an influencer in your industry. This is a separate category from exposure because those who are exposed to your brand by an influencer convert more readily than those who are simply exposed to your brand. In this way, discovering a brand through an influencer is more like learning about a company through a friend. As businesses have begun to recognize the power of influence, there’s been a need to measure how influential people are. Companies such as Klout are not only using algorithms to attempt to measure influence, but they’re also creating a marketplace where you can search for influencers in topics that are relevant to your industry. To quantify the value of influencer outreach, you measure how many influencers mention your brand, estimate the reach achieved through those efforts, and in the next category of the funnel — engagement — measure the response the company receives. There has been a lot of debate over exactly what engagement means, but for the purposes of this discussion we will say that engagement describes when somebody takes physical action to interact with your brand during a particular timeframe. It’s at this stage that you can start quantifying who is engaging with your brand. This is where the value of social media really starts to widen management’s eyes, as it is particularly well suited for this purpose. What’s more, by its very nature social media facilitates and encourages two-way interactions with brands. So it enjoys a significant advantage over traditional media, which simply isn’t equipped for that level of interaction. Engagement is placed one level further into the sales funnel because the theory is that people are more likely to buy from your brand if they have taken the time to engage with it. The big difference between exposure and engagement is physical action. Engagement is measured based on the end user having to physically take an action to engage with your brand, for example, clicking on something, typing a comment or sharing a message. Because there are numerous ways someone can engage with a brand on social networks, the ease of getting the data to quantify engagement varies greatly from channel to channel. This stage of the new social media sales funnel is actually where most companies would traditionally begin. It’s solely dedicated to qualified leads and prospective customers who go on to purchase your products or services. Once you get to this stage in the funnel, the metrics are the same, but the response is evaluated independently for each social media channel that is used. This is probably the most overlooked area of measurement for marketing channels. For some reason, once companies get a customer, they tend to move on and forget to measure the customer’s life cycle. Retention is crucial for determining the overall profitability of customers you generate. Once prospects have become customers, you use different marketing activities to put them back into the top of the funnel, where they go through the buying stages to make future purchases. Although they go back into the funnel, they tend to go through the stages much more quickly because there is already a familiarity with your brand. If you kept them happy during their first experience, they are more likely to buy again. As a result, you actually perform two types of analyses for existing customers. Similar to action/conversion, the metrics used to evaluate customer retention do not change with each channel. Instead, you measure the performance of each channel to see whether one channel is performing better than another. Chances are, once you’re able to explain the benefits of social media through the use of the sales funnel, management will be on board with implementing social media in its operations. This is good news, as social media allows companies to extend the sales funnel and attract customers earlier in the buying cycle, essentially bringing opportunities to the door when traditional marketing would close them out. Are you measuring the effectiveness of your social media efforts? What metrics have been helpful to you in getting executive buy-in?